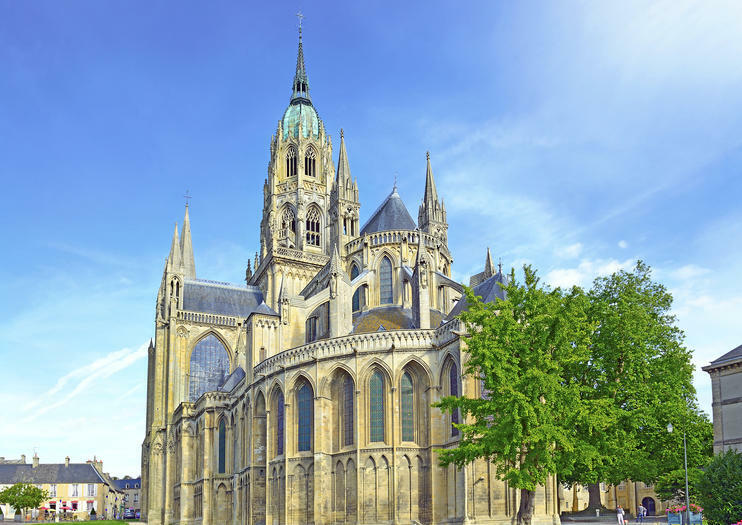 A National Monument of France and one of Bayeaux’s most eye-catching monuments, the Bayeux Cathedral (Cathedrale Notre Dame de Bayeux) is best known as the original home of the Bayeux Tapestry (now a UNESCO ‘Memory of the World’ and displayed at the nearby Bayeux Tapestry Museum). Originally built in the 11th-century, the cathedral’s Gothic façade was reconstructed in the 12th century, but much of the Romanesque-style interiors remain intact, shown off by atmospheric lighting during the evening hours. Consecrated in 1077 by Bishop Odo of Conteville in the presence of his brother and King of England, William the Conqueror, the cathedral’s strong English ties are portrayed in its vibrant frescos, which depict the life of Thomas Becket, the Archbishop of Canterbury, and of course, the iconic Bayeux Tapestry, said to have been commissioned by the Bishop to decorate its nave.